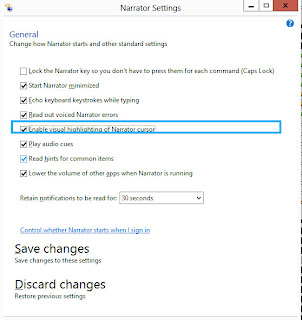 Today I discovered a most annoying feature of Windows by accident: the Narrator's highlight active area option. There I was just trying to use the computer and this stupid blue box kept appearing around where the cursor was. 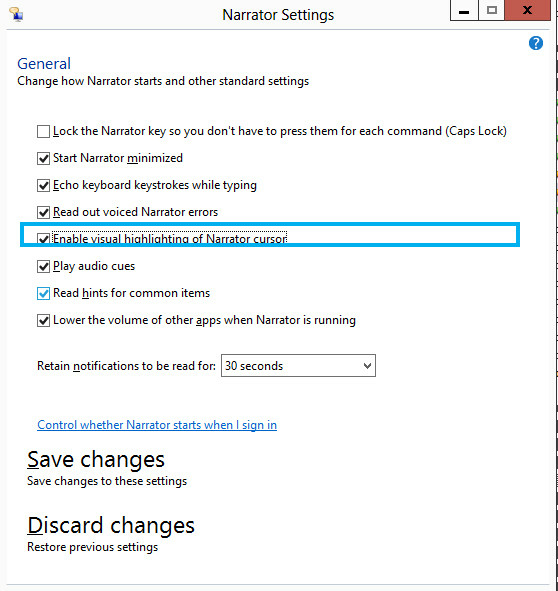 On Windows 8 the Narrator is a touch-screen app and the short-cut key is Windows logo key + Enter. Is there a short-cut key? "ctrl-n" or something that makes this appear? This is surely the most annoying feature! This really helped me, thank you! I went to programs, typed in narrator, and turned it off. Thank you so much for this simple solution! I've no idea how I turned this feature on, but I'm so glad I got to turn it off. Drove me crazy for a good hour or so! Wow, so glad I found this post. It was driving me nuts! It was a torture, thank you. Win10 is loaded with "features" that have a mind of their own.